When Austin approved plans to renovate Congress Avenue’s bridge over Town Lake in 1980, the city had no idea what it was in for. Having incorporated 16-inch-deep expansion joints into the bridge’s new design, its engineers had unknowingly drawn up blueprints for the perfect bat flat. It turned out that the expansion joints, narrow gaps that ran the length of the bridge’s underside, were an ideal roost for Mexican freetails. Hundreds of the little flying squatters began moving in shortly after the completion of the deck. Congress Avenue Bridge had inadvertently been designed with several very narrow bat caves, whose population soon numbered into the hundreds of thousands. Off the bat, residents reacted with fear. They voiced vehement concerns over rabies. Many were horrified at the thought of all that guano contaminating the water below. (One resident proposed the building of a feces-containment structure.) Others were worried about the detrimental effects on the bridge itself, concerned that bat excrement would corrode its materials and collapse it into the lake. Austinites, not batting an eyelash, set about evicting the uninvited pests from their little lakefront high-rise. But the task wasn’t going to be easy. It’s a relatively simple matter to shut out a few bats from small areas like attics and belfries––thanks to the Internet, you can purchase a nice Acme-sounding device called the EX-100 Hanks Bat Excluder––but to convince 1.5 million of them to leave an open-air structure like the Congress Avenue Bridge, citizens had to get aggressive. They duly responded with some really serious petitioning. Thanks to BCI’s efforts, the capital city’s attitude toward their winged invaders turned a complete one-eighty. In just a few years, Austin fully embraced the bats, demonstrating its affection the best way Americans knows how: commercial exploitation. It now advertises what has become the largest documented urban bat colony in the world as a featured tourist attraction, which was estimated in 1999 to have a positive fiscal impact worth up to $8 million. Today, it’s a summer tradition to visit the bridge and witness the swirling, dark clouds emerging into the skyline. 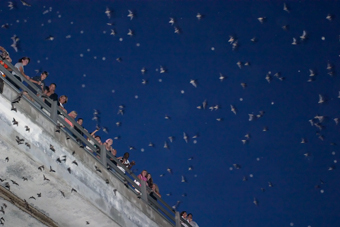 Locals and out-of-towners alike arrive nightly to cheer on the bridge’s stunning nocturnal emission, which they can now do from a specially maintained bat-observation area. Visitors can also attend the annual Freetail Free-for-All celebration, sponsored by the same newspaper that once helped to fuel the city’s bat-rabies fears. And let’s not forget the nautical, bat-watching booze cruises, with honeymoon package available. 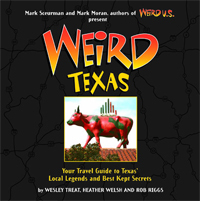 In 1995, the Texas Legislature designated the Mexican freetail bat the state flying mammal. The following year, Austin established a minor-league hockey team and named it the Austin Ice Bats. 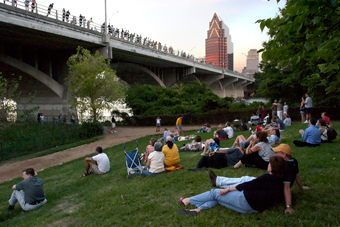 1998 saw the raising of a bat-venerating sculpture sponsored by several local businesses, and the United States Postal Service chose the Congress Avenue Bridge in 2002 as the site to announce their commemorative American Bats stamp series. Austin, which previously despised its bats, has now crowned itself the Bat Capital of America. Once mercilessly unwelcoming, the city has gone––say it together, now––completely batty.